Choral Arts Alliance of Missouri provides exceptional choral arts experiences, accessible to all individuals from beginning youth to professional musicians. Through each of its choral ensembles, CAAM seeks to foster greater understanding and appreciation of the choral arts, build a sense of community, and make connections with a diverse demographic with its varied educational and outreach programs. 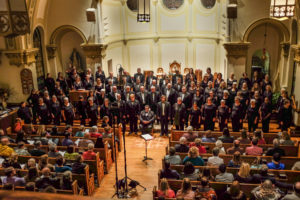 As the area’s only large-scale community choral program, CAAM is unique in providing a space for anyone who wants to sing without requiring any auditions, from age 7 through the seasoned adult. CAAM originally began as Columbia Chorale, which was chartered in 1978, and continues to thrive as the region’s premier mixed-voiced community ensemble for adults. In 2013, CAAM expanded to offer Columbia Youth Choirs (CYC), a youth choir extension for grades 2-12, to supplement existing musical opportunities for youth in both the school system and the community. In 2014, Columbia Chamber Choir was established as an auditioned subset to the Chorale to perform repertoire more suited for smaller numbers. The newest extension is Prometheus: An American Vocal Consort, a 12-member professional ensemble that joined CAAM in 2015.